Eltronicschool. 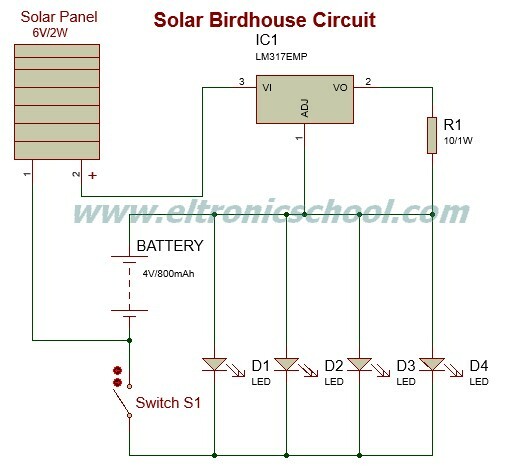 - This is one of the circuit schematic of Solar Birdhouse using LM317 IC like in Figure 1 below. The main component are used in this circuit are solar panel, LM317 IC and LEDs. In this time, we will give you one of electronic circuit schematic of Solar Birdhouse using LM317 IC description and component needed when you want to build it yourself. Circuit schematic like in Figure 1 above is Solar Birdhouse using LM317 IC. According Electroschematics site describe that this solar birdhouse light is an economical circuit of a mini solar lighting system circuit is presented here. At the heart of the circuit is a mini 6V/2W solar panel. Here, this solar panel is used to charge a 4V/800mAh rechargeable battery through a charge current limiter circuit built around an adjustable 3-pin regulator LM317T (IC1). Resistor R1 sets the output current. The lighting circuit comprising 20 white LEDs are directly powered the battery. Swich S1 is a simple on/off switch. Assemble the circuit on a small PCB and enclose in a suitable cabinet. Fix the solar panel on the top of the cabinet and power switch and LEDs on the front side.